Greece maintains the largest merchant ? eet of ships in the world, which as of December 2014 comprised of 4,894 ves- sels with 291,735,318 deadweight tonnage (dwt) and 168,922,455 gross tonnage (gt), leaving Japan second, and China third. The core of the shipping cluster con- Greece stands out as the least competi- shipbuilding ? 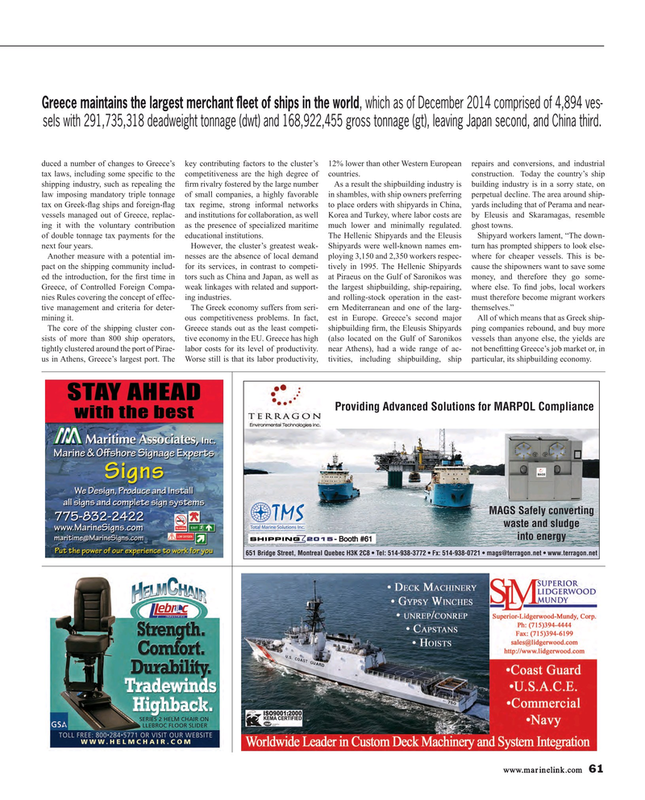 rm, the Eleusis Shipyards ping companies rebound, and buy more sists of more than 800 ship operators, tive economy in the EU. Greece has high (also located on the Gulf of Saronikos vessels than anyone else, the yields are tightly clustered around the port of Pirae- labor costs for its level of productivity. near Athens), had a wide range of ac- not bene? tting Greece’s job market or, in us in Athens, Greece’s largest port. The Worse still is that its labor productivity, tivities, including shipbuilding, ship particular, its shipbuilding economy.